I love this place!! I’ve had a variety of treatments here. My favorite being the hydra-facial! My face always feels so fresh and clean afterward. I’ve also had laser done on my cheeks for my rosacea and it has reduced the redness significantly! The laser can sting a little, so Karen makes sure to give me ice to place on my skin so that I’m more comfortable during the treatment. I’ve also had a peel and my skin glows!! Their prices are incredibly reasonable and affordable, which makes regular visits easier to do!! I love it here and highly recommend this med spa!! I have been going to Canton Medical Aesthetics for laser hair removal since it opened. It is beautiful inside, very clean and always smells great. The staff is extremely knowledgeable, professional, and experienced. I’ve also had a HydraFacial there and it was awesome, can’t wait to have another. Ask for Karen, she’s the best! This place is amazing! I have had both botox and laser hair removal done at CMA and my results have been fantastic! I would not go anywhere else! Dr. Tantillo did my botox and I literally looks years younger! Karen M. did my laser hair removal and I have not had to shave my arms or bikini line in months! I could not be happier and I highly recommend CMA! Karen and Nikki are so awesome at this. I had a fascial recently and my skin was like silk!! 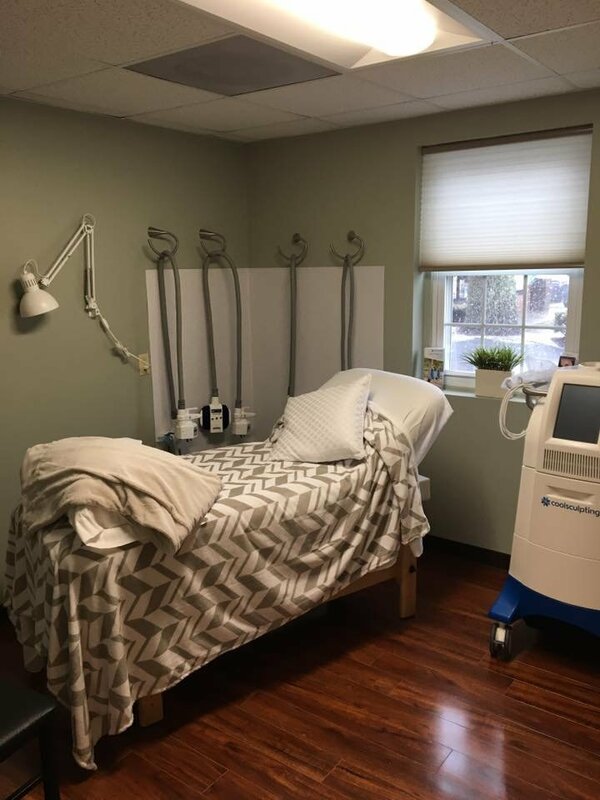 It is relaxing and they have a lot of different skin care services like laser treatments, cool sculpting, Hydrafacial (which I got) Botox of course and fillers, facial peels, medical facial work and skin care products. They are real professionals, friendly and make you feel right at home in their peaceful environment!! FIVE STARS ALL AROUND!! I am in love!!!! This is the first time I’ve ever gotten any facial enhancement. I got juvederm fillers in my lips – full syringe total! Dr. Tantillo and Nurse Chamberlain made me feel so comfortable and it didn’t hurt at all!! Now I can finally wear lipstick and have more confidence! This place is amazing. The staff are always so friendly and very professional. I have been for various services and plan on continuing into the future. Prices are great too and even offer various payment options for coolsculpt making it very affordable. Karen is such a sweetheart. She’s personable and professional every time. I won’t have laser treatments done anywhere else. Let me start by saying how inviting and clean this place is!! I was treated by Nikki and she was super friendly and knowledgeable and answered all my crazy questions. The room they put you in is spacious yet cozy and she made sure I was comfortable before we began. I’ll definitely be back again! I followed Karen from her old location in Natick to her new location in Canton. She knows her stuff, is very professional, and super nice. I highly recommend them. I’ve only been one week out but I can personally say that Cool Sculpting does not hurt one bit. You can feel that this non invasive, procedure is working it’s magic and I can’t wait to see the results. Karen Merry and Nicole are both knowledgeable and incredibly thorough which made me feel that much better going into this. They have a very clean facility with both TV and wifi to keep you occupied during the procedure. Looking forward to trying a HydraFacial next ladies! I had a HydraFacial with Nikki and I can’t wait to get another! I take really good care of my skin, always have, and I was blown away when Nikki showed me how much of a deep clean this really gets your skin! Sure I exfoliate 2 times a week and always wash my face twice a day, but there is nothing like this facial to get it super clean and hydrated! Then when applying makeup a few days later, it went on so smoothly and seamlessly, I looked airbrushed with just tinted moisturizer on! The location is perfect and the office is SO clean, friendly and inviting! I can’t wait to go back for laser! The location was really easy to get to and the office is beautiful. They made me feel very comfortable, and answered all of my questions. I wouldn’t trust my laser hair removal to anyone else!!! Thank you! Great service, great office. Everything was done to make me feel extremely comfortable and at ease. Nikki took care of all my needs and answered every single annoying questions I had. Highly recommend this office and Nikki. I just had the hydrafacial treatment and it was amazing!!! Not only did it feel wonderful–the results are awesome! My skin has never felt so fresh!!! I’m glowing!!! I will definitely be back! I had a great visit today, all of the rooms were clean and welcoming, my hydrofacial was amazing! Can’t wait for my next visit! I had a hydrafacial with Karen- my face feels amazing!! It was both a relaxing and very effective treatment. I have pretty problematic and dry skin and this facial is everything I need! My next appointment is already in the books! The medical technician was very professional and timely! I love the staff at CMA, they are all very professional, smiling and pleasant. The office is extremely clean and welcoming.